If there’s one room in your house that should feel like a total oasis, it’s your bathroom. The look and feel of this space can set the tone for how you start or finish your day. If your current bathroom doesn’t inspire relaxation, it’s time to think about updating to a spa-inspired space. Why Create a Bathroom Spa? Have you ever been to a spa for a massage, facial, or other treatment? If so, think about the atmosphere and feelings you experienced there. From the moment you walked in, you were greeted by subtle, relaxing colors, pleasing images, peace, and quiet. You released any built up tension and felt more at peace. So why shouldn’t you have the same experience at home? We think you should, and you can! 1. Consider Your Color Scheme: Before you begin your spa bathroom renovation, you’ll want to choose a soothing color scheme. Cool colors like light blues and greens are peaceful shades that are related to the earth. Soft grays and purples are also tranquil options. 2. Feature Natural Elements: At professional spas, you often see natural elements throughout, such as plants, stones, or wood. You can use these elements as inspiration for your home. Incorporate stones on the wall or floor of the shower, opt for wood cabinets or flooring, and add some greenery to the space with small, easy-to-care for plants. 3. Include Extra Storage: Spas are never cluttered on the counters, cabinets, or other storage areas. In your new bathroom, make sure there’s plenty of storage for items you might keep on your counter or throw on a shelf. Add some cute baskets and other organizational tools to help keep your bathroom stylishly clutter free. 4. Separate Your Tub: If you have the space, consider separating the tub and shower. You can choose a deep soaking tub, a clawfoot tub, or a tub with jets for a true spa-like feel. This allows you to create a relaxing shower space as well. 5. Update the Fixtures: As part of your bathroom remodel, you’ll want to update your fixtures. You might want a more sleek and modern look with cleaner lines, or you might want fixtures that are more high tech. You could add a steam element or a rain shower head to the shower, or you could create a his-and-hers shower. 6. Add Aromatherapy: Another major feature of professional spas is the use of aromatherapy. If you love soothing scents, you can easily add an essential oil diffuser to your spa bathroom to infuse the air with the scent of lavender, lemon, vanilla, or any scent that helps you relax in your space. Ready to Create Your Own Bathroom Spa? 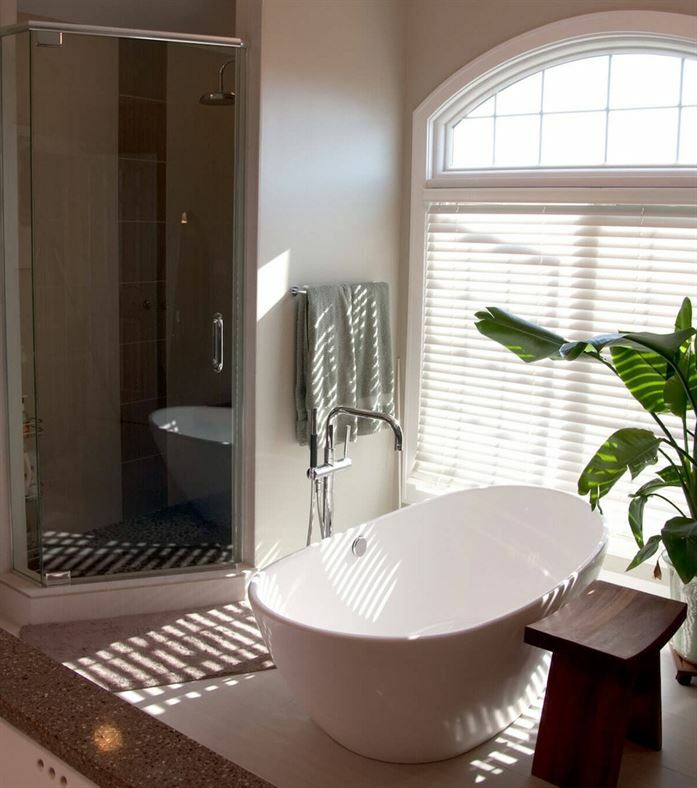 To learn more about renovating your bathroom, contact LaMantia Design and Remodeling in Hinsdale. We’re here to bring your dreams of a spa-inspired bathroom to life.